What will the royal baby's nursery look like? Speculation is rising about the preparations being made by the Duke and Duchess of Cambridge for the royal nursery. Will it be white flounces and stuffed toys? Or will it be austere like the one provided by Queen Victoria for her children at Osborne House? In this child-centred age we expect something uplifting and imaginative. Hello! Magazine has already speculated that William and Kate will choose the same design company that created nurseries for William himself, his brother Harry and their cousins Beatrice and Eugenie –Dragons of Walton Street in Knightsbridge. Their look might please Kate. It isn’t showy, but it is solidly built with a dash of fun. Dragons specialise in handmade furniture painted with characters from Beatrix Potter, bears, flowers or fairies. Common sense and whimsy work hand-in-hand. Customers have included Victoria Beckham, Gwyneth Paltrow and Madonna. Samantha Cameron and Sophie Dahl have also bought wooden chairs with rush seats here. But the style Kate chooses all depends what kind of mother she will be. Will she be the anxious type? In which case she might be interested in a project to develop the Intellicot. This will be the smart phone for cots, with automatic rocking, mattress elevator, air circulation, nightlight and video monitoring. Or will she go for natural, sustainable products and include family iconography as she did at her wedding? 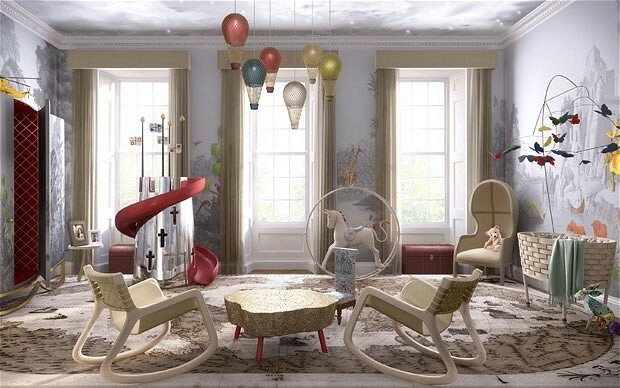 Photo above: Designer Christopher Prain's illustration of what the royal nursery could look like, created for the Redbook Agency. A model of the Duke of Cambridge's helicopter can be seen on the left. Should you need any advice about custom size baby mattresses or bespoke made cot sheets for your child's nursery, please don't hesitate to contact Baby Mattresses Online - we've made rather a few celebrity baby mattresses over the years and only last week delivered one to an England footballer's home.